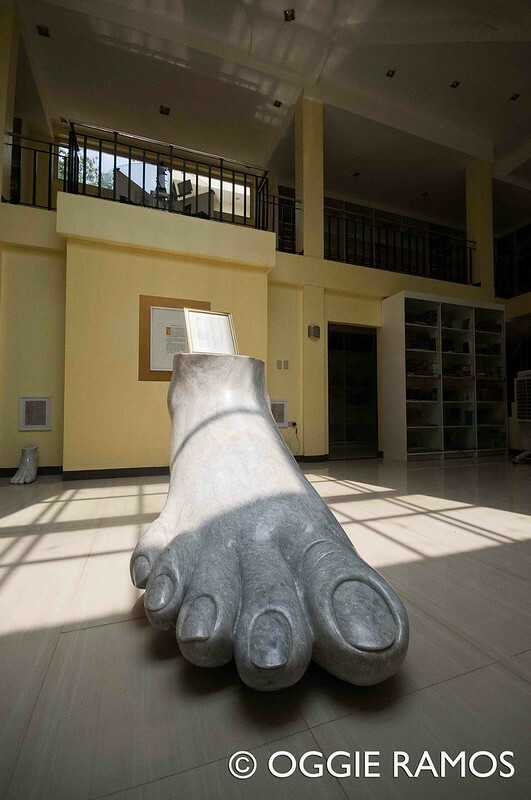 I find it apt that the predominant element in the Marikina Book and Ethnology Museum is the foot. 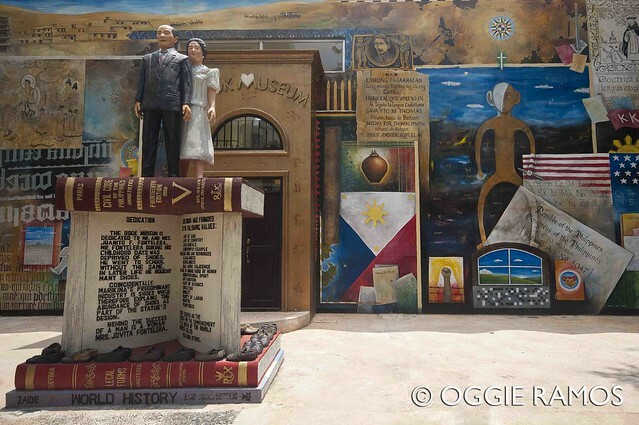 Here I was, admiring the mural depicting world and Philippine printing history done by renowned Baguio visual artist, Leo Aguinaldo, on the facade of the Book Museum and espying a pair of slippers of one of the workers. To me, it is symbolic on many levels; first and foremost, that a visit to these two museums is akin to taking a journey to different times and manifold places without leaving Metro Manila. Another meaning I see is that the foot represents wandering, seemingly a lost art nowadays when people would rather consult Google Earth than relish the rewards of getting lost and discovering something new. To begin with, the idea of building a Book Museum is a curiosity in itself especially when it's a project of the chairman and president of one of the country's institutions in publishing, Rex Group of Companies, and the timing of creating such a museum: an age when e-books seem bent to supplant physical books, if not completely, perhaps consigning them to the status of well, museum pieces. Oh, but I love books of both kinds as I love reading and the idea of going to a Book Museum seemed like the most natural thing to do. Marikina was, is, and probably will always be synonymous with shoes. The city's Shoe Museum is a must-visit/must-stop-for destination among tourists either interested in its history or intrigued by the sight of hundreds of pairs donated by the former First Lady, Imelda Marcos. Now, if the idea of having a Book Museum will catch on, the city can also be known as the purveyor of books and culture. 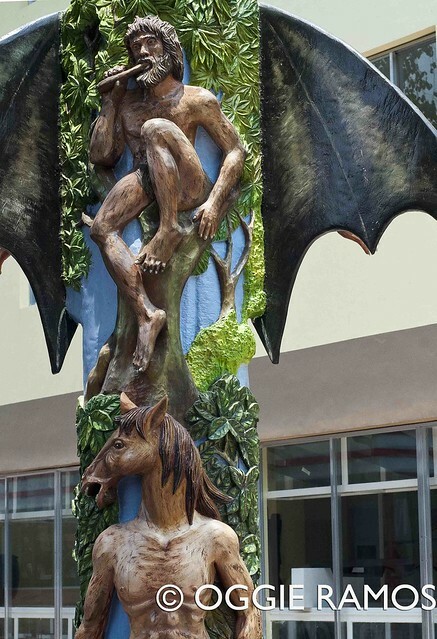 Entering the compound along Dao Street in Marikina Heights, one is greeted by towering totem poles bearing creatures of Philippine mythology as well as indigenous culture -- the manananggal (vampire), kapre (tree giant), tikbalang (half-man, half-horse creature), et al, carved by Angono artists. 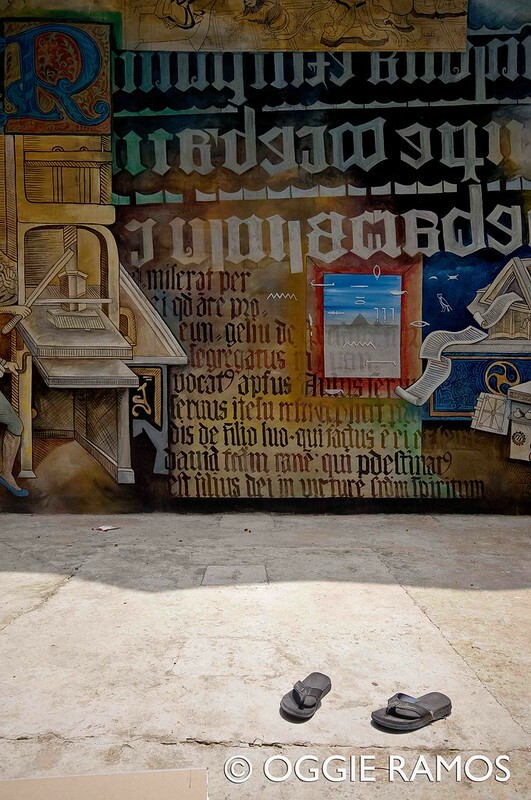 The Book Museum is actually located at the back of the compound but the colorful mural on its facade calls one's attention ahead of the Ethnology Museum housed on the ground floor of the building which also houses a dormitory on the upper floors. Hop around the world -- The evidence of the power and influence of the printed page can be readily gleaned at the Book Museum. The museum displays the personal collection of Atty. Dominador Buhain, the chair and president of Rex, amassed from his own travels to 76 provinces in the Philippines and 211 countries all over the world. The collection was archived in alphabetical order by the former National Library chief librarian, Fe Abelardo. We noticed empty shelves here and there. Our museum guide, Ivy, noted that these are places wherein books and publications have not been given much attention, hence their absence from the shelves. Rarities and spectacles. As with any other museum, this one has its share of smallest/thickest/widest curiosities. The highlight of the Book Museum is the circular shelf on the second floor where some really rare and really small books are on display. 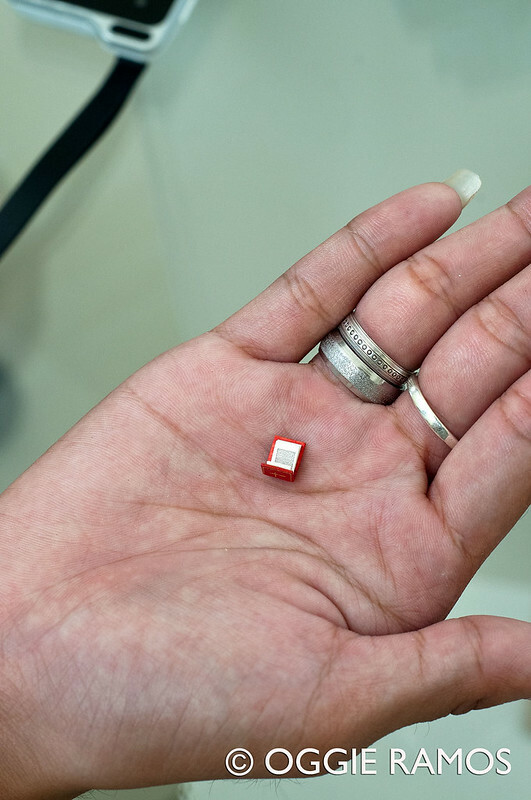 The smallest one (and among the smallest in the world) is a book of prayers measuring just 3.3 x 3.3 millimeters acquired from the Gutenberg Museum in Germany. 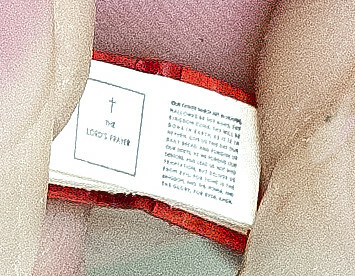 I didn't know what was printed there until I came back home, processed the images and magnified a page, seeing the Lord's Prayer inscribed on a page I shot. Incredible. There's also a 40-volume collection of Shakespeare's works arranged on its own mini-shelf measuring less than a foot high. Doubtless, you need a pair of powerful magnifying lenses or even a microscope to read the text but it's pretty amazing given the possibility of printing this small before nano-printing technology became a reality. I would like to think that the collection represents more than the journeys of one man. Rather, it is a testament to the power of the printed page everywhere in the world. Hieing up the highlands and combing the south in two hours. If the Book Museum seemed more of a personal collection accumulated on a continuing expedition, the Ethnology Museum at the front of the compound seemed to me as more of a cultural journey. It's bewildering to browse through close to 500 pieces in two hours but we attempted it, hoping to visit again soon for closer, more detailed inspection of this collection curated by Professor Ike Picpican, curator of the St. Louis University Museum in Baguio. I see the museum as essentially divided into two parts: the north and the south. The northern part is located at the front, displaying a treasure trove of artifacts -- necklaces, baskets, weapons, and farming implements of the people from the highlands up north, mainly from Ifugao, Abra and Kalinga. The pieces from Ifugao are readily-identifiable as most bear carvings of the ubiquitous gecko. Going to the back portion of the display area, the monochoromatic displays give way to bright colors -- what I call the southern part of the museum. Here is where interesting curios, including the elaborate, filigreed awnings of the Maranao house, as well as the colorful woven garbs of indigenous ethnic groups can be found. There were places where artifacts from the north get mixed up with the south, perhaps owing to the large volume of the pieces and space limitation. The weirdest (eeriest is more like it) piece is the sorcery "wand" from the northern highlands used by local shamans dating back to headhunting days, which came complete with human and animal skulls. 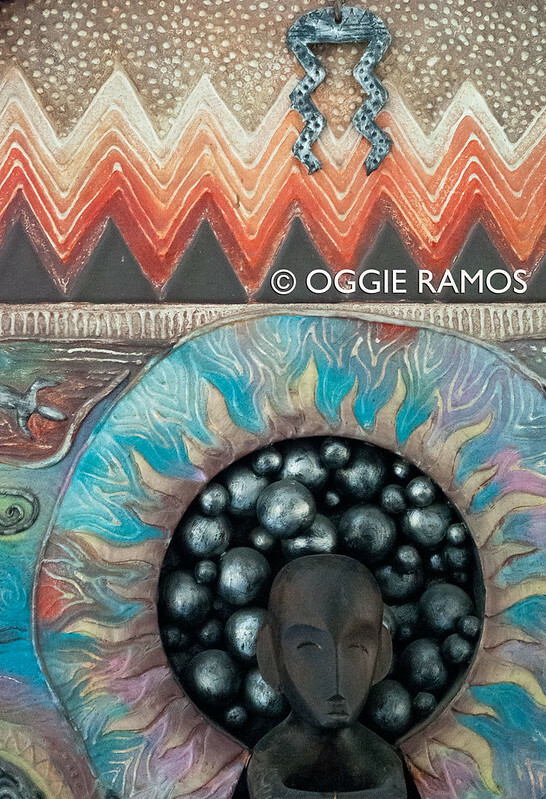 Such pieces are so rare, notes Noemi, our friend from the Rex Group, that even museums up north don't have them. 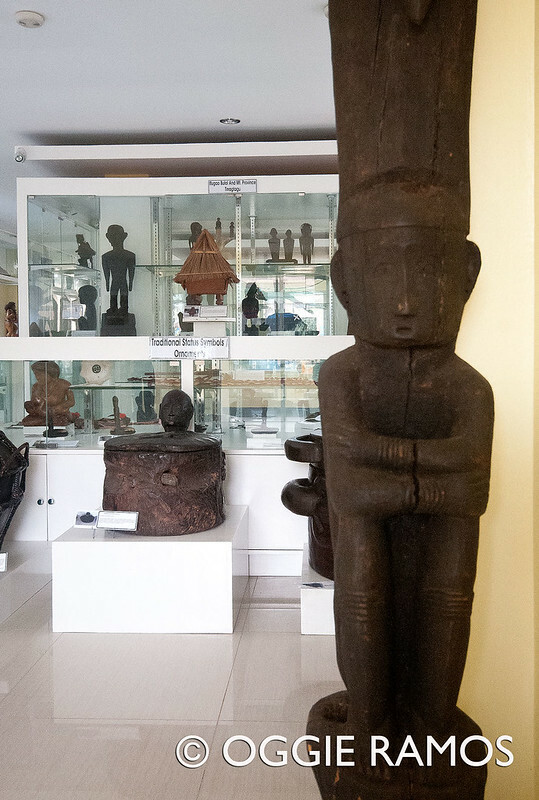 The ethnology museum can serve a valuable purpose especially to kids (also adults) who have not been to the places of our IPs, a veritable exposure trip that can open their eyes to the richness and diversity of our culture. Perhaps, it may even goad them to one day consider going to these places and seeing for themselves the origins of these artifacts. Work in progress. The museums have opened only last March and as such, I see it as a work in progress. I see so many possibilities that can be explored to make the museums even more engaging and interactive. The labels on the displays, especially of the Book Museum, can be more detailed to aid the guest. It would also be wonderful to be able to get the proponent's insights as to how traveling to all these countries have expanded and enriched his world view. I also believe that books are really meant to be read to be appreciated so it would be nice to be able to peruse the travel collection (perhaps in e-book form to avoid the pitfalls of manual handling) if a guest prefers to do so. To further espouse the "reading is priceless" advocacy, the outdoor areas can be a venue for storytelling and poetry reading. 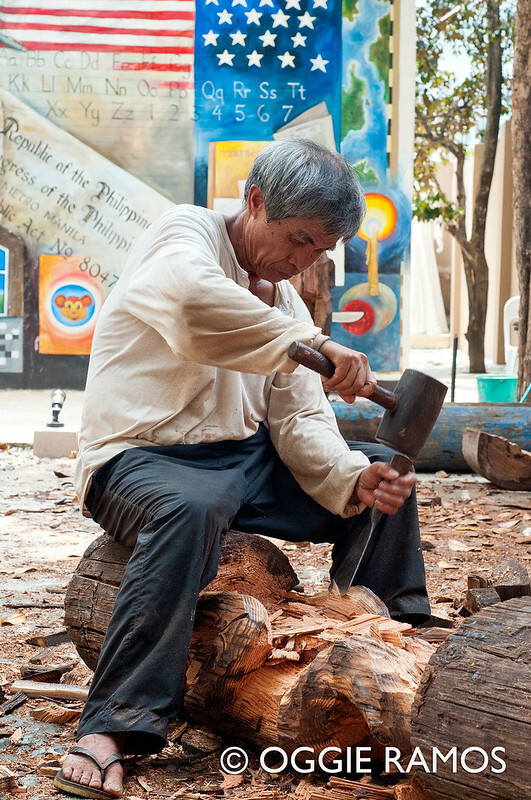 To help promote the arts, particularly of the indigenous people, the place can become a meet-and-experience area for art enthusiasts to see visual artists at work or even as a place where they can have "customized" pieces made. Lagalog thanks: Ms. Noemi Cruz of the Rex Group for facilitating this preview tour of the Marikina Book and Ethnology Museums.